Licensed for 4 users on a single machine. 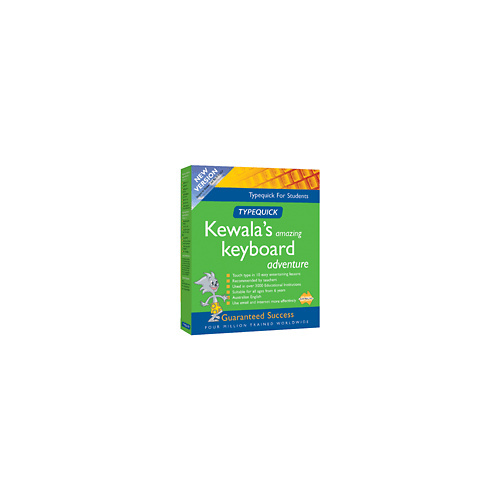 Includes: 1 CD, User Guide, and Mental Rehearsal keyboard layout card. A wild, animated adventure which is guaranteed to teach touch typing, TYPEQUICK for STUDENTS tells a story in a compelling and believable environment in which the user can easily lose themselves for the ten hours it takes to learn to touch type. Typequick for Students is a truly interactive animated movie containing rich artwork and animation with over 2500 pictures and 64 full screen background scenes all in 256 colours. There are 900 WAV files that add great entertainment to the whole experience. 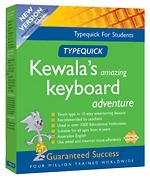 Unlike other typing tutors which have a few corny games bolted on to boring exercises, Kewala's adventure is fully incorporated into the TYPEQUICK course. This fascinates teenagers who keep coming back to continue the course. Easy to use, Typequick for Students manages the learning environment, at the same time giving the user the feeling of being in control of the program. We have also removed the anxiety created by the questions found in other typing tutors, for example, "Which letter would you like to learn next?" Typequick for Students has all the same artificial intelligence, motivation, remediation and teaching techniques seen by users in our previous award winning products. It is recognised as the fastest tutor with the highest success rate. Typequick for Students signature course "Finding the keys", is a structured course of 10 lessons, hidden in 10 routes, which follow a logical teaching order. You are guided from lesson to lesson, so the Typequick 'teacher' always knows where you are and what you need in the next lesson. The first 8 routes will teach you to type with ten fingers, without looking at the keys. You will be able to read what you are typing, it's a great feeling! Route 9 is to build up speed, and route 10 is to develop accuracy - helping you to get it right more easily, more often. Once you can type without cheating, you are ready for the BIG CHALLENGE. In this section you are challenged by interesting characters and you use your typing speed and accuracy to get even. Once you successfully complete all the challenges, you will reach the Kingdom of Eaz where everybody can type with ten fingers. Meaningful text - Exercises are modelled on English sentences and not on nonsense words. Stories and characters are built through the typing text. This helps you enjoy the learning experience. Occasional nonsense drills are included to build concentration and to practise unusual letter combinations. Relevant reporting tools - Clear reports are displayed at the end of every lesson part. Users can view progress at any time during the course through the Statement of Proficiency or Progress Reports.